A Preview of Middlemarch: It’s B-A-N-A-N-A-S! – The Bookshelf of Emily J. A Preview of Middlemarch: It’s B-A-N-A-N-A-S! When I went to Goodreads to mark Middlemarch (number 20 on the BBC book list, which I am working my way through) as “read” and to give it five stars (yes, it’s that good), I noticed that most everybody else who had written reviews of the novel felt the same way I did. Here’s a sampling of what I saw. Siobhan said, “Best. G*?%*ed. Book. Ever. Seriously, this sh*t’s bananas. B-A-N-A-N-A-S.” Okay, Siobhan. Calm down. We get it. You loved the book. Alex wrote, “Middlemarch is a towering achievement. It’s tough to find words strong enough to describe it.” I must concur. There are no words. Well, unless you go back to what Siobhan said. There are some words for you! Anyway, you get the idea. These people loved Middlemarch, and so do I! Although I won’t use as strong of words as Siobhan, or leave it on a bookshelf in Fiji for somebody else to discover, I will tell you all about it. I officially declare this week on my blog Middlemarch Week. It’s a long book, a deep book, and one that deserves a whole week dedicated to it. However, after I’m done writing this week, I still don’t think I will have articulated exactly why this is one of the best books I have ever read and probably one of the best ever written. It’s not an easy read. There were times that I became drowsy and put the book down for a nap. There were times that I wondered why on earth I had to read about gambling or politics, when all I wanted to know was if and when Mr. Casaubon would die. I struggled through it, but at the end, I felt a sense of accomplishment, triumph, and true love for this famous Victorian novel, published in 1874. Have you read it? Is it B-A-N-A-N-A-S? Not simply a book to read, it is a book to reread. Yes! That is the perfect description. It’s one of my favourite classics, too. I think if you read it, it has to be a favorite. It is perfection! Soooooo glad to hear you really appreciated Middlemarch. I can’t wait to read all of your posts this week. It is on my top 10 list of favorite books for all time (actually, George Eliot is one of my heroes and mentors — SHE is bananas! 😉 ) I read somewhere that Middlemarch could be like a bible of sorts, all about navigating relationships, vocations, duty, dreams, mystery, and the all the rest of life. George Eliot was such a great humanist and I think her theory of the interconnected web of human relationships is exquisitely illustrated in this book. You are right — it is long and deep, but so rich and full. It is like being immersed into a river, instead of merely skirting about the shallows. We’d all be better off, in my opinion, if we made the time to take on writers like Eliot, works like Middlemarch. They can help us to be better than we were before we met them. Awesome. I hope you and Siobhan agree! How could we not? Besides, two people I respect, you and one other, recommended this over the past two weeks. It’s a sign!! 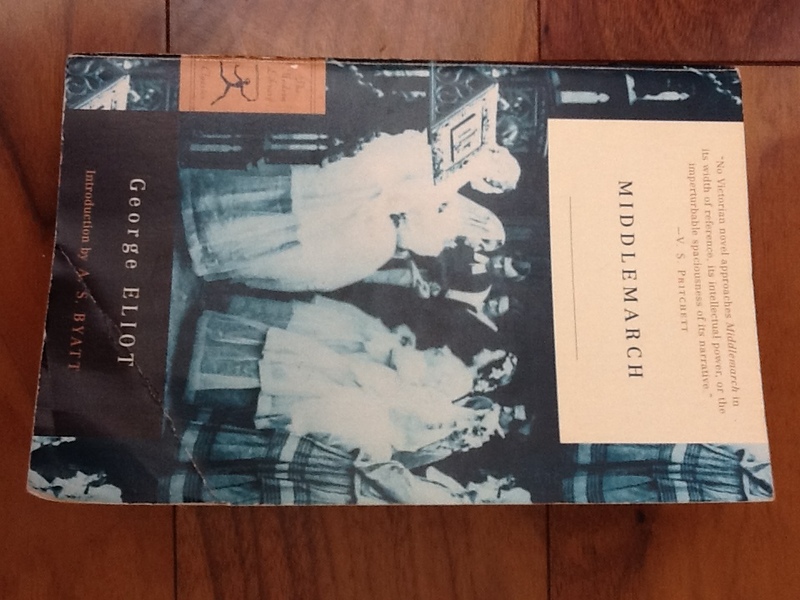 I do love Middlemarch and George Eliot. Bananas? Maybe not, but certainly beautiful and instructive. To be honest, my remembrance of the entire plot is a little rusty. Probably time to reread. I’m really excited to read your posts this week! Bananas was not what came to my mind either, but I can see why Siobhan wrote that. It gets the point across. Thanks for reading! I hear you. There’s never enough time to read and always too many books! Yes, I’ve read “Middlemarch.” It’s the best Nineteenth Century English novel, in my opinion. So insightful about human nature, and a wonderfully complex plot full of interesting characters. I love Eliot’s writing style, and I really enjoy her wit. It’s a great read. It IS a great read. I am so glad I finally got to it. I have the book, but have yet to read it. I think tonight’s a good night to delve back into true literature (after my failed attempt to muddle through Fifty Shades Of Grey). Thanks for the recommendation. I think Middlemarch is the perfect palate cleanser after Fifty Shades of Grey, which I have not read, but I have heard enough to not want to read it. It’s on my ‘to read’ list too. Thanks for the great review – I think I am off to download it now! Oh good! I hope you like it. Is it horrible that I haven’t heard of Middlemarch? I can say that I will go out on a limb, trust your review, and request it from the library right now. I don’t think it’s horrible. I hadn’t read it until now. It is an intimidating book! I like your blog, by the way, I’m glad I found it via freshly pressed. Pingback: George Eliot on Marriage, Human Nature, Money, Politics, Religion, Feminism, and Gossip in Middlemarch « The Bookshelf of Emily J.
Pingback: The Best Quotes from Middlemarch « The Bookshelf of Emily J. Okay, now I have to read it. You are most welcome! Put it at the top of your list.